A single, curved, cot gold vinyl, Royal Enfield script style sticker. Sticker measures approximately 250mm by 50mm and is designed to fit our standard curved front mumber plate blank as shown in the photo. Royal Enfield Pudding Basin Helmet & White Scarf Cafe Racer Sticker. 3". Austin Old Style Script Text Cut Vinyl Sticker. 3 or 6". 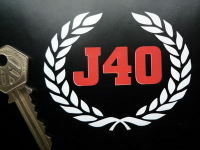 Austin J40 Pedal Car Cut Vinyl Sticker. 3.25". Girling Master Cylinder Special Offer Stickers. 2.5" Pair. 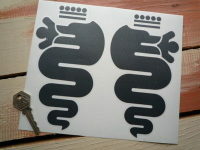 Alfa Romeo Serpent Stickers. Cut Vinyl. 7" Pair. Alfa Romeo Serpent Stickers. Cut Vinyl. Various Colours. 4" Pair. Gulf GT40/LeMans Style Helmet Visor Sunstrip Sticker. 12". 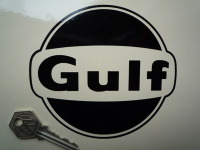 Gulf Cut Vinyl Logo Sticker. 5". Alfa Romeo Modern Style Logo Sticker. 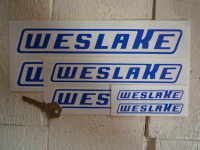 2.75", 4", 5", or 8". 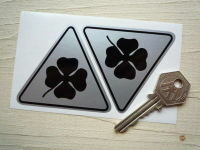 Alfa Romeo Cloverleaf Triangle Black & Silver Stickers. Various Sizes. Alfa Romeo Wheel Centre Stickers. Monochrome. Set of 4. 50mm. 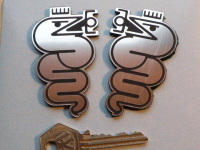 Alfa Romeo Serpent Laser Cut Self Adhesive Car Badges. 3" Pair.